If you can't find the words to express your vitriol for buyers of the Apple Watch Edition, leave it to ASUS to come up with an extremely biased (in the name of humor) explanation of the wrongdoing that is spending 10 grand on the most premium Apple product ever. It starts with one simple question - "Are you out of your mind?". And then, according to ASUS, buyers of the Apple Watch Edition are out of their minds, but takers of the ASUS ZenWatch are fine and logical. Mildly entertaining as it is, this infographic is misguided as it gets, and it also illustrates a symptomatic misconception in the reception of the Apple Watch Edition. Everyone seems to (sometimes deliberately) miss the point that Apple has a $350 Apple Watch Sport, which costs $150 more than the ZenWatch, is the same in functionality as the $10k Apple Watch Edition, and will sell fine to Apple product-liking folks. The Apple Watch Edition was made explicitly for the rich and famous, and Apple is going to make mad dough selling it to them. For the rich, the Apple Watch Edition is just another lavish luxury watch to display the time, their financial status, and their appreciation for fine watchmaking. Nothing wrong with that. If you can afford one, get one - you earned it! It seems the ones out of their mind are ASUS's marketing people who rally Android Wear militants with cheap shots and expect millionaires to wear the $199 ZenWatch instead of the you-know-who watch. In fact, ASUS should go back to the drawing board and offer luxury Android Wear watches alongside regular models, or it will miss out on significant market opportunity. Huawei and LG are already after the rich with the Huawei Watch and G Watch Urbane, which makes perfect sense. The infographic - not so much. If i have an android phone, ok ill buy android wear, if i have an iPhone and I've been waiting years for the apple watch, then ill buy the apple watch. They're both smart watches, they're both great operating systems. I don't have to choose...i'd still go get a minimal looking traditional'e' analogue wrist watch. None of these flatter me. I'll go with rolex even a hundred years it'll still be functional and not outdated. 10k for 1 apple watch 10k for 8,000 zen watches. ill go with zen,,.. I think the math works out to 50 ZenWatches. Zenwatch is a really good-looking watch, unlike apple watch. Sorry, but apple watch looks like a toy for kids that you would find in a happy meal box. 10K for an apple watch that will be out dated in 12 months. Sure! What? It was outdated when they first showed it. Every Apple product that is released as new is outdated at least 2 years before. That is fact. The iPhone 6 has a 1.2MP front camera, which dates back to 2004. The iPhone 6 has 750p for the display. 720p dates back to 2010. The iPhone 6+ is 1080p. The first phone I recall that sported 1080p was also in late 2010/early 2011. 8MP cameras? 2010. In fact when the Mac Air came out, most PC's were on Sandy Bridge and Apple was still selling Core 2 Dual Mac's and the first Air was C2D as well. You sound ridiculous. Bringing screen resolutions in like they're outdated. Quad Hd and etc are not needed. Most people don't have tvs and laptops higher than 1080p. Tbh, I agree with Asus, they do have the point there, even though they're advertising it wrongly. Apple Watch Edition is just a niche product, which the majority doesn't care about. Why would you get a $10k Apple Watch which works like a $200 smartwatch and have to charge it every day when you can stay classy and get a Rolex? Most rich will get a luxury watch instead of a "luxury" Apple Watch. There are smart rich and dumb rich. So, of course, dumb rich will go for the $10k Apple Watch because they're out of their minds. 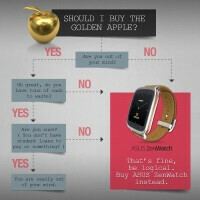 So, if you think getting a $10k Apple Watch is a good choice, then you're out of your mind. PA, you're out of your mind. OMG... this ad is plain wrong. It will have the opposite effect. Just like the "scroogled" campaign by Microsoft, or when they mocked the iphone saying that the nokia 630 could do the same things for much less. Results? None. People are not rational when they choose objects, and it's unbelievable that such big companies do not understand how to advertise. The author of this article is trying too damn hard to justify Apple's watch prices. The $349 comes with a toyish like color band and the smaller screen. Are we really gonna get into this "Screen Size - bigger is better" debackle with the watch face too? Unless you're that rapper, ... I dont think the large screen size fits this category - slap a tablet on your wrist and you won this battle! I think he is simply referring to the 38 mm version being the one that costs $349 while the 42 mm version costs $399. 38 mm is usually the size for womens' watches. I guess that's for you, at least until Apple decides to make the screen bigger....again. What fun is Apple gave the band a funny name. However when you look at it, you can see its just rubberized plastic. Yet it costs 349. Yet the Gear S was blasted for having a plastic band and its 299. At least it doesn't need a phone to work like the Apple Watch does. lol. To be fair, 299 is to much to pay too. But since it does have a phone onboard, paying 50% the cost of an actual smartphone and I have similar capabilities including a web browser, I'd say 299 for a phone is a steal vs paying 349 and it isn't a phone. I can buy a phone with better options for 349 or less. Without an iPhone the Apple Watch is a useless toy. You can even use it with a phone. The Gear S can be totally setup and works without a phone. You don't even need a phone to put apps on it, the phone just makes it easier. At least he didn't say, "If you have room on your credit card, get one - you earned it!" He's right though, if you have $10,000 cash laying around with nothing specifically for it to go to like Student Loans then technically you did earn it. Even if spending $10,000 on a watch is stupid. Hell that's a higher price than me and my wife paid for both our vehicles this year. $5200 for a 2003 Ford Explorer and $4,500 for a 2005 Hyundai Elantra GT. Both those prices were after taxes. I think it's stupid to buy that watch but it's not my money after all. And its the smaller, feminine 38mm that's $349! The 42mm version is $399. Someone woke on the wrong side of their bed? I mean, there was a lot of #bendgate promotions/poking that was funny and posted on PhoneArea, but this is totally unaccaptable? I don't see that happening. Apple products hold their value remarkably well. The Watch Edition may not be on the same planet as premium analogue watches, but it's of excellent build quality nevertheless, and it is a novelty, which makes it attractive. Also, people have nurtured this overwhelming perception of mobile technology growing obsolete in mere months, just because we get smartphones that are twice as powerful each year! Tell you what, I had that mentality as well, then I had a former classmate show up at a gathering with his iPhone 3GS - all beat up, still running like a champ. Blew my mind! Yeah, it doesn't record 4K or anything, but when he begins to care, he'll get himself sorted. :) Appreciate the discussion, fellas!